Japans earthquake and the related Nuclear incidents at the Fukushima Daiichi power plant has recalled the threatening endangerment of nuclear power. 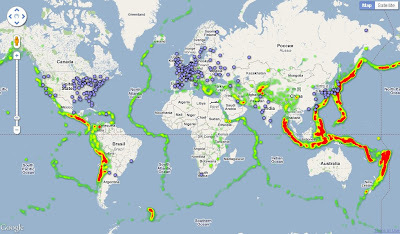 The author of maptd.com has wondered about the location of worldwide power station, in relation to active earthquake zones. The location of 248 atomic energy plants, including numbers of reactors. Represented by blue markers. The seismic data are from the United States Geological Survey and the nuclear power station information the International Atomic Energy Agency. The map is built from two Google Fusion tables, here and here. To see the actual locations of the earthquakes you can toggle the heatmap off and display markers instead. Map of global earthquake activity and nuclear power plant locations.